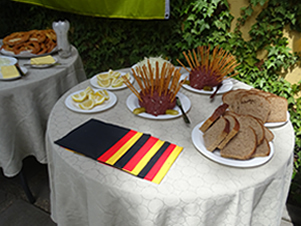 A few years ago, travelArt began to celebrate the beautiful tradition of the Day of German Unity in our office. As a German-Chilean company, we want to ensure that our employees experience both cultures, and the 3rd of October lends itself perfectly to this. 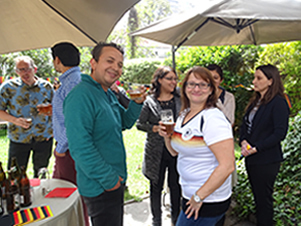 Flags of Germany adorned our garden, and German bratwurst, mettwurst and vanilla ice cream with red berries also made our German employees feel at home. 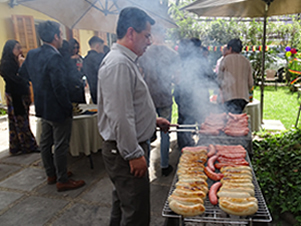 Our Chilean colleagues also enjoyed these ‘exotic’ delicacies, and some Turavion colleagues also enthusiastically celebrated the Day of German Unity with us. We of course offered good German beer to everyone. Everyone had a great time and came together as one.